Alcat Test results were the base for elimination diet treatment in several ailments regarded as the result of food allergy (intolerance) in 72 patients (45 children and 27 adults). The best results were achieved in arthritis, urticaria, bronchitis, gastroenteritis (83%, 75%, 70% of improvement in treated patients respectively). Worse results were observed in children hyperactivity, rhinitis, and atopic dermatitis, (32%, 47%, 49% of improvement respectively). Less satisfactory effects of the elimination diet treatment based on the Alcat Test results in the two latter diseases may result from the considerable involvement of IgE-mediated mechanism in the pathology of the skin and nose, which are under a great influence of external environmental factors other than food. In 57% of patients skin prick tests were positive (in 35% with inhalants and foods, 12% with inhalants only, in 9% with foods only). The pathogenetic role of food hypersensitivity in atopic dermatitis (AD), urticaria, migraine, epilepsy, emotional disturbances, nephrosis, arthritis, respiratory and gastrointestinal tracts have been observed for decades (1-8). It was difficult to confirm the role of harmful food owing to a lack of objective, sensitive methods. The IgE-mediated allergy methods were the only ones available. This mechanism has been proved in pathology of migraine – 3-5%, nephrosis – 0%, urticaria – 7%, cases of AD -50% (1, 4, 7, 9, 10). Other harmful foods could be determined by the laborious elimination diet, difficult for both the patient and the clinician (11). The Alcat Test is a new, non invasive, in vitro method for identifying harmful food by describing changes in white blood cells sizes. The process is automated and computer controlled, excluding all subjective observations of cell size and recognition (12). The study was carried out on seventy two patients (45 children and youth and 27 adults all aged from 3 months to 67 years) suffering from different symptoms of unproved etiology (AD, migraine, abdominal pains, vomiting, nausea, diarrhea, rhinitis, bronchitis, oedema and arthritis, urticaria, asthma and emotional disturbances: hyperactivity and chronic fatigue syndrome).All patients were treated earlier with antibiotics, steroids, sedatives, ointments, different diets regiments without improvement. An Alcat Test with 50 foods, skin prick test (SPT) with 11 common inhalants and 28 foods and detailed history were performed. Clinical assessment was made as to whether the diet tailored on the basis of the Alcat Test results was a success or a failure after one month of an individual elimination diet. Emotional disturbances were assessed after 4 months of the diet. 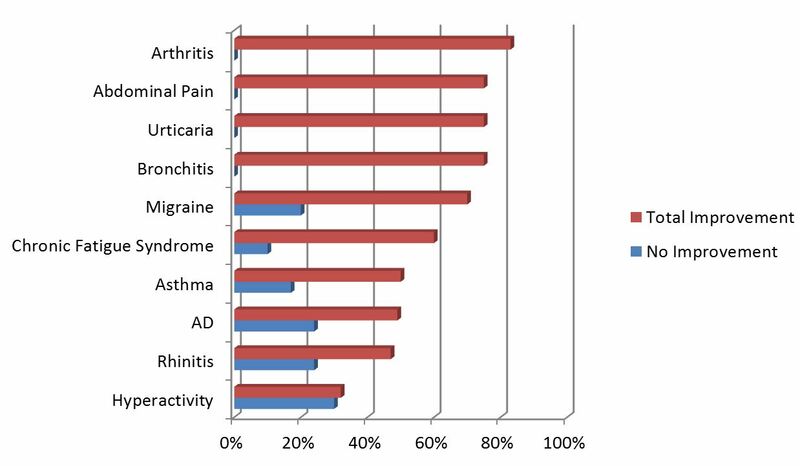 Total improvement of 83% of arthritis patients, 75% of urticaria, bronchitis, and gastroenteritis, 70% of migraine, 60% of chronic fatigue syndrome, 50% of asthma, 49% of AD, 47% of rhinitis and 32% of hyperactivity was observed. Lack of any improvement in 30% of hyperactivity patients, 24% of AD and rhinitis, 20% of migraine, 17% of asthma and 10% of chronic fatigue syndrome, was noted. The other patients showed a different range of partial improvement. The most often harmful foods revealed by the Alcat Test were: chocolate, mint, yeast, tea, cola (90%, 83%, 75%, 56%, 53% of patients respectively). Other foods: coffee, soya, rice, beef, wheat flour (22% to 26%), rye and corn flour, egg, pork (18%, 16%, 12% respectively). Cow’s milk was not estimated being in the course of laboratory investigation by the owner of the method. In all patients granulocytes were the cells which responded to the challenge with offending foods. IN 2-45 of patients platelet reactions were observed. Lymphocytic reactions were noted in only one patient (cola). IgE-mediated mechanism (SPT positive) was noted in 35% of patients (inhalants and food), 12% (only inhalants) and 9% (only food). In AD and rhinitis SPTs were positive in 57% of patients. In 43% SPT were negative. SPTs in arthritis, chronic fatigue syndrome, migraine and urticaria patients were negative. The lack of objective tools for the estimation of non-IgE mediated mechanisms resulted in such expressions as “not known,” “nervous,” “endogenous,” “idiopathic,” for the etiology of many disease in literature and handbooks and in a symptomatic way of treatment. The Alcat Test warrants further investigation and a wider application in many disease possibly related to food sensitivity to clarify the “not known,” and “idiopathic” fields in medicine. This test describes the effect of the influence of different environmental factors on leucocytes in the patient’s blood. It does not measure IgE-mediated reactions (12). Double-blind placebo-controlled food challenge (DBPCFC) has been until now the only method recognized by scientists to establish correlation between SPT and provocation test. It is also known, that this method can only by introduced for IgE reactions for which 8g of food allergens in a capsule is sufficient. It seems that this amount and the manner of applying the DBPCFC was modified by Fell et al to evaluate the correlation of Alcat Test results and the food provocation test. In 19 patients with AD, migraine and irritable bowel disease, positive correlation was 79.3% negative – 87.5% (13, 14). The relationship between food and different gastrointestinal problems in children was described by Sandberg with the aid of the Alcat Test to identify probable harmful food. The paper gives all the evidence that the majority of sensitive reactions to food in gastrointestinal problems involve other than IgE-mediated mechanisms (10). The data of Fell et al. concerning the inhibitory effect of sodium cromoglycate on granulocyte response to food antigens in vitro show that the Alcat Test gives evidence that other, non-IgE-mediated mechanisms in many symptoms connected with food were possible (15). Our own experience gives evidence that an elimination diet, based on non-invasive, in vitro Alcat Test results, improves symptoms in 50-83% of patients, who could not improve on pharmacological treatment. The best results were obtained in migraine, arthritis, worse in AD and rhinitis. SPT with inhalant are more often noted in skin and nasal symptoms, which are more exposed to inhalants and other harmful, external factors. using the Alcat Test in the course of allergologic diagnosis helps to describe less common foods that may cause reactions similar to that of apple, beetroots, lettuce, leek, pears, millet, oat or rice etc.